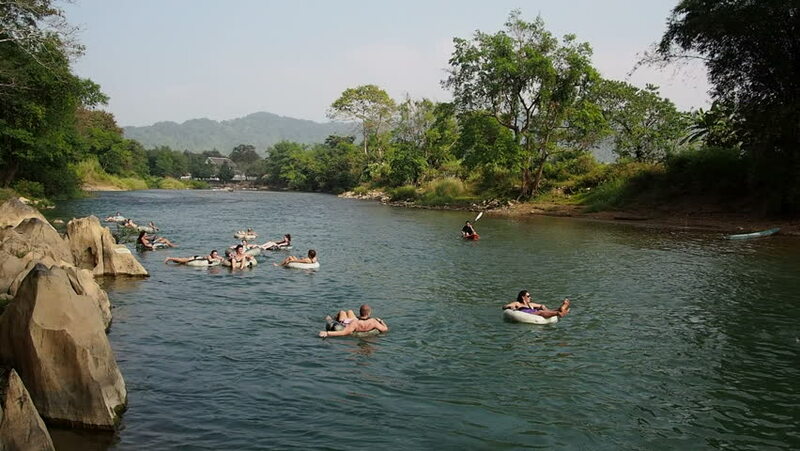 Nearly every backpacker has heard of tubing in Vang Vieng. If you haven’t heard about it from friends or past travellers then you may have heard about it on the news, unfortunately, due to previous deaths. What a great way to start a blog post hey?! 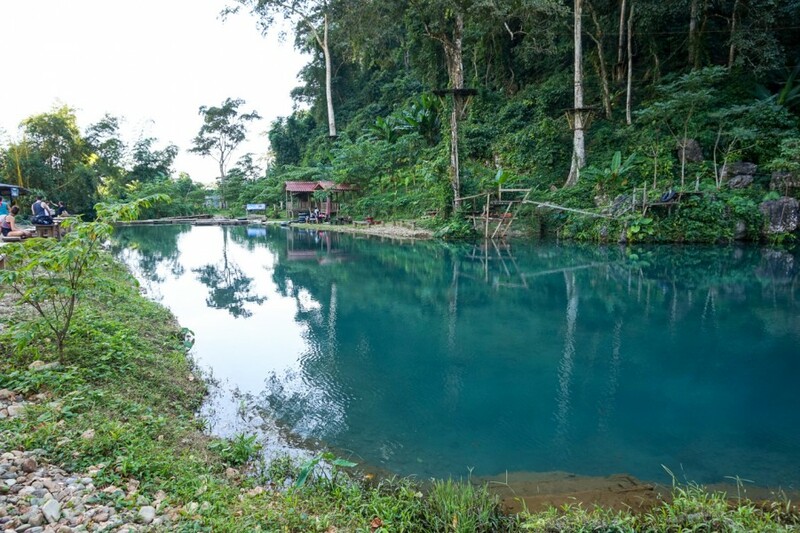 Although the party tubing scene in this small mountainous town is quite different to what it was 10 years ago, it’s still active and being visited by 1000’s of backpackers every season, and with reason. It’s good fun! 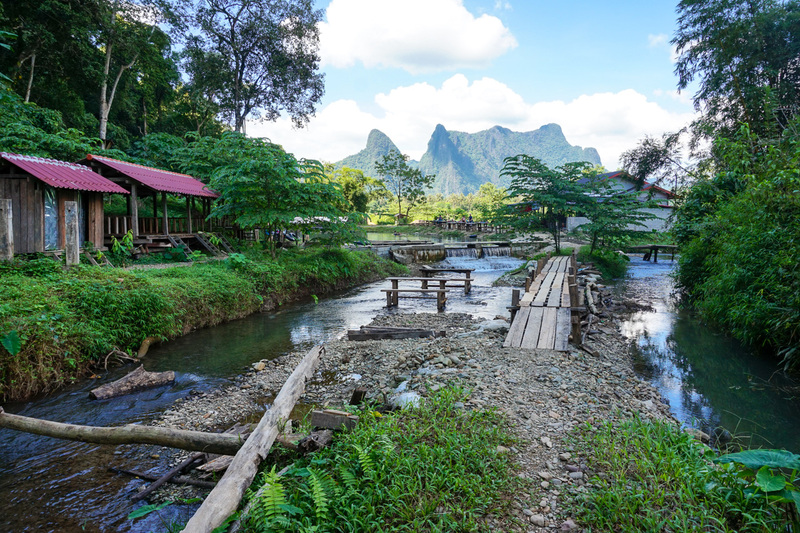 Vang Vieng can be reached via tourist bus in as little as 3 -4 hours from the capital city of Vientiane making it high on the tourist trail. 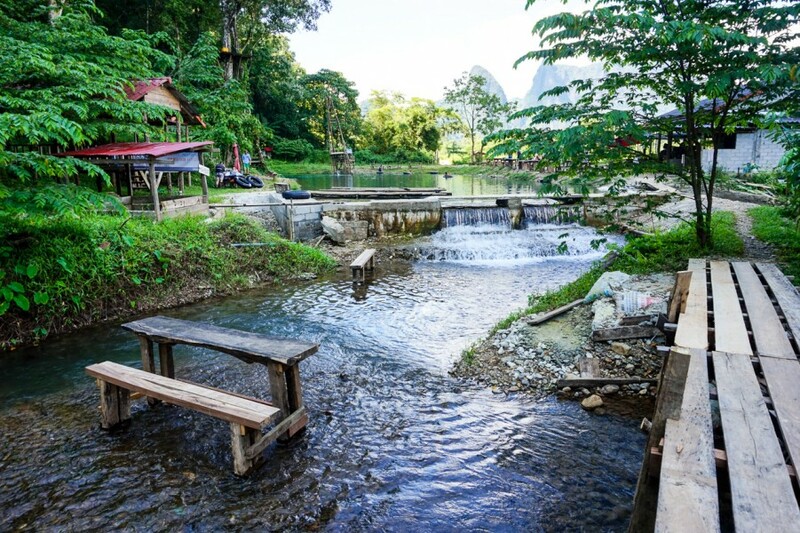 What is Tubing in Vang Vieng? The concept of tubing is simple. 1. You rent a rubber tube from one of the offices in town for 55,000 kip + a 60,000 deposit (returned if you return your tube by 6:00 pm). 2. 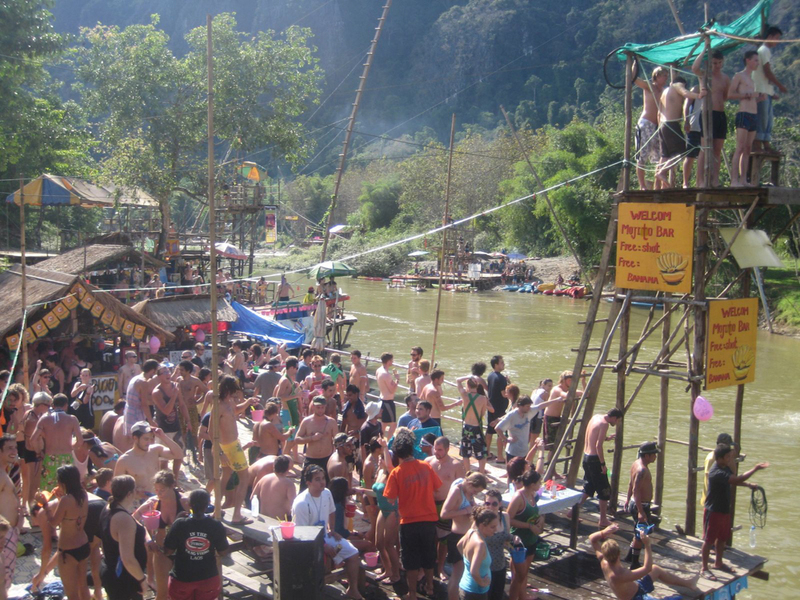 You all pile in the back of the provided tuk-tuk and head 3km to the start of the tubing route on Nam Song River. 3. Jump in your tube and start floating. 4. Stop at the bars, get involved in the games and leave with a whole new set of friends. Sounds pretty fun to me right? Right. We started our day with an old time favourite breakfast at the Aussie Bar. It had been years since we scoffed down a decent bacon, egg & cheese roll. Heaven. To avoid the tubing crowds, we signed into the office just before noon and were off by 12. Ten minutes later we were at the river and we didn’t waste any time. 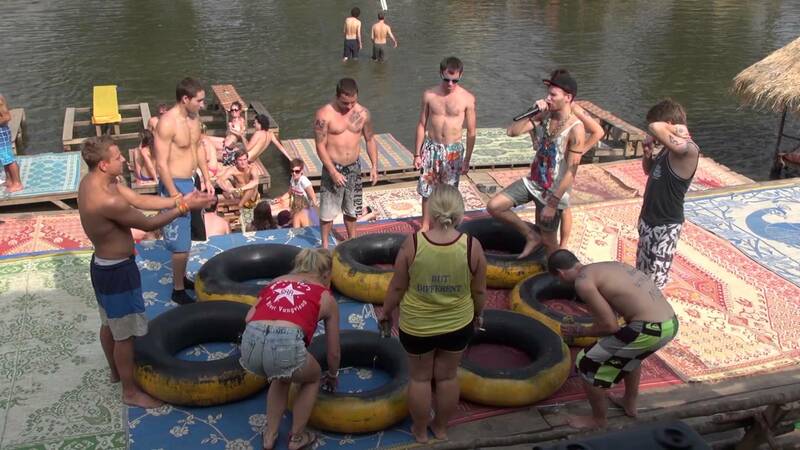 The first bar we went to was just a 3-minute float down the river. We wished it had been longer, but what can ya do? To help us reach the bars on the edge of the water and avoid us being washed downstream, the bar staff threw us a rope with a filled plastic water bottle attached to it and pulled us in. Clever people. As soon as we arrived, the music, games & silliness began. They had beer bong, musical tubes, arm wrestling, dance off’s and goofy costumes. The whole place had such a great energy. We must admit, we do love us some daytime drinking! After about 2 hours at the first bar, everyone jumps back in their tubes and continues to cruise down to the next bar on the river. The first bar becomes empty and all the same familiar faces are now partying together again at the second bar with similar games. 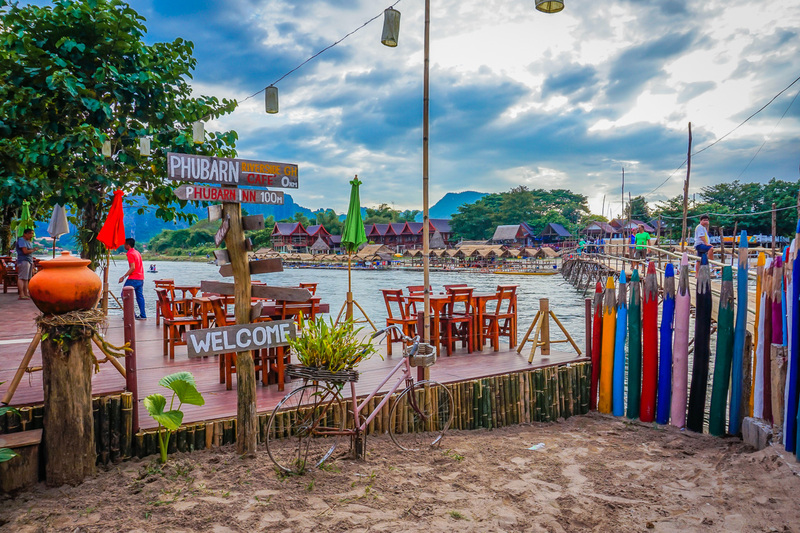 Once you reach the end of the tubing route, the party then continues on into the evening at Sakura Bar in town. 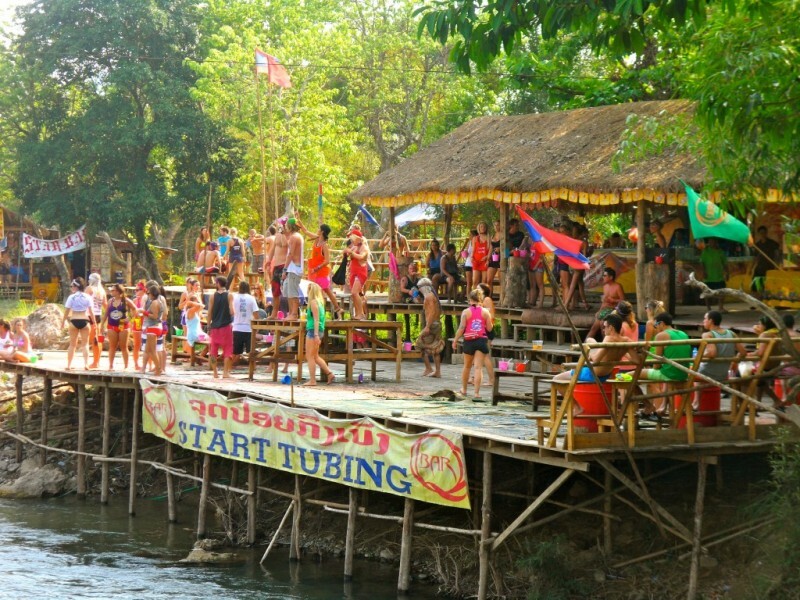 The main difference between tubing in 2016 and tubing in 2010 are the number of bars open along the river, as well as the lack of rope swings and “death slides” which since removing, has saved many lives. Instead of 11 bars open all along the river at once, they are now only permitted to have 2 open at a time and they work on a rotational basis. 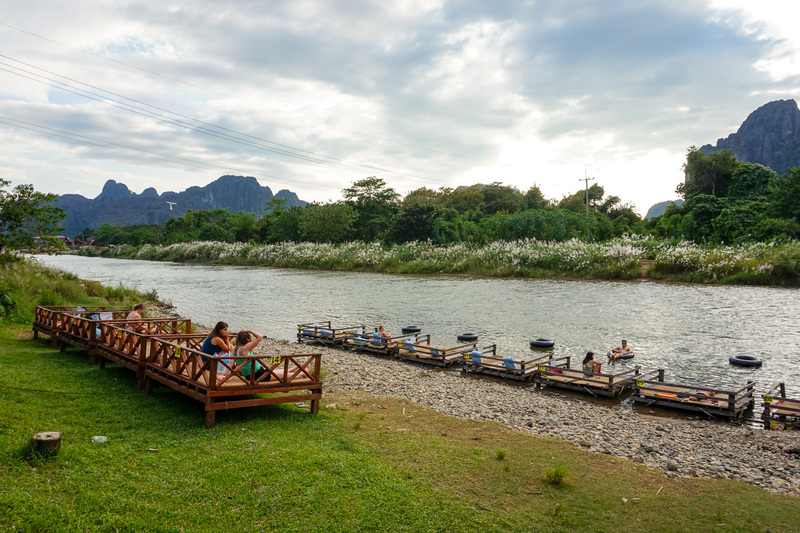 We didn’t see Vang Vieng in full throttle, but after partying there, in our opinion, it was a smart move by the Laos government to crack down on the silliness, especially since in 2011, 22 travellers died while on the tubing routes. Unfortunately, this crackdown took a few years and way too many deaths, but there is a balance now and the activities are a whole lot safer. Even so, it was still a considerable amount of fun and having only 2 bars open allowed everyone to stick together, as opposed to being spread out along the river. 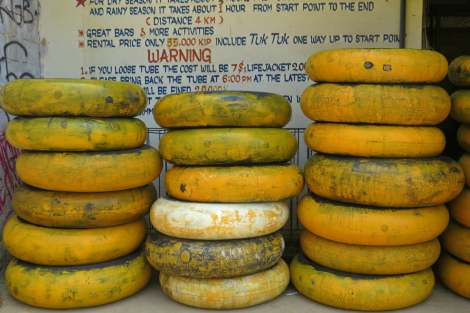 There are now 2 tubing routes open for tubing… red and yellow (or white). The concept is the exactly the same for both routes, however, the difference is where you begin on the river. We had no idea about these differences and signed up with the first company we saw (red tubes) and unfortunately, that day, it happened to be a very quiet day yet. There was only 8 of us but it was very relaxing, to say the least. The second day we went on the yellow route and it was much more party oriented with 60 odd party goers. In high season, it can get up to 400 people. The second day we went on the yellow route and it was much more party oriented with 60 odd party goers. In high season, it can get up to 400 people. 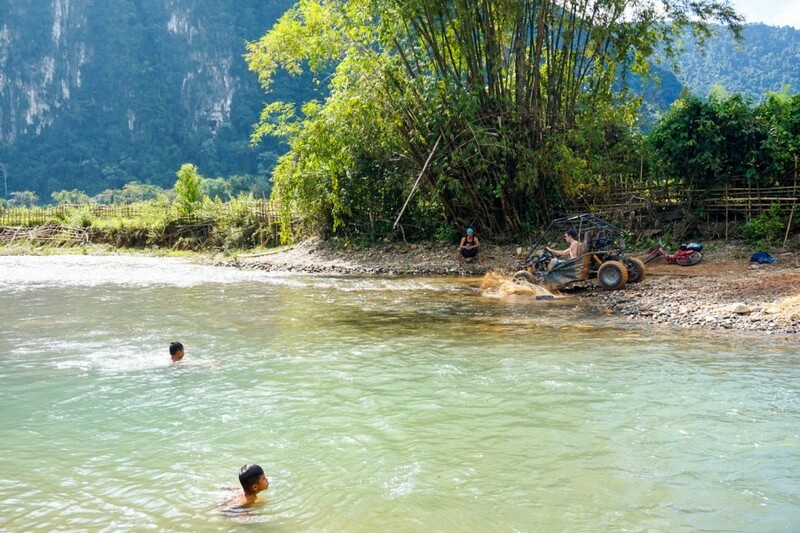 Red Tubes – You drive south for 15 minutes to the starting point on the river and then continue to head further south in the tubes and then a tuk-tuk is there to collect you to bring you back to the town. 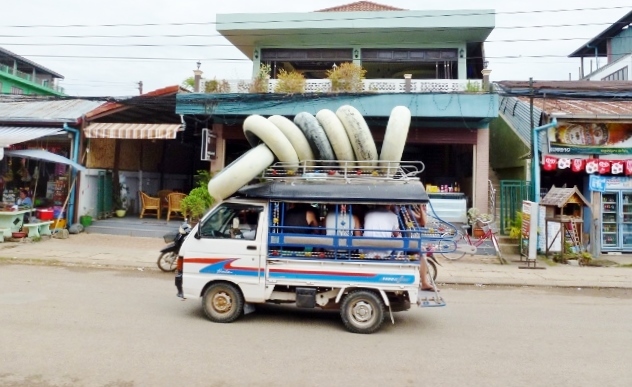 Yellow/White Tubes – The tuk-tuk drives you north up the river and then you float south and hop out in the centre of town to walk back to the tubing office. Don’t pre-drink – We get it, pre-drinking before a party is fun, you always want to get the party started but please don’t pre-drink before tubing. It is so unnecessary. The drinks are made strong whilst you’re on the river and you’re out and about in the sun. Trust us. Buy yourself a dry bag – This can be done in the town for very cheap. There are all different sizes, shapes and different qualities. Leave your phones at the hotel. These bags are not 100% waterproof and there’s no need to risk losing your phone at the bottom of the river for just a few photos. We carried money in a plastic bag inside the water pouch and that was it. 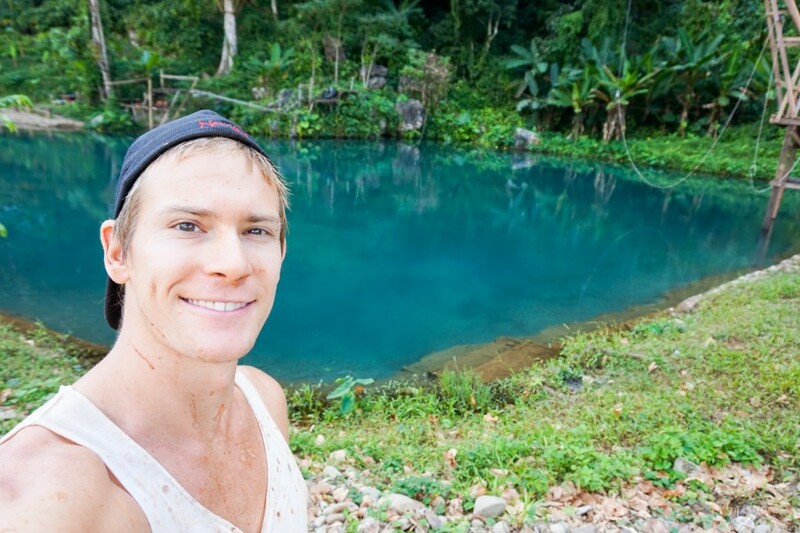 Pack your Go Pro/Waterproof Camera – This is the one time we wished we’d had our waterproof camera. Unfortunately, it left us a few short months ago so the memories are solely in our head (maybe a little hazy too). Make sure you strap it on to your wrist tightly before heading down the river. Eat a decent breakfast – Food is available at the bars but it can be limited to just tiny toasted sandwiches. Fill your belly with a delicious bacon egg cheese baguette at the Aussie bar for cheap as chips before you head out for the day. Don’t go later than 12 – To maximise the time you have on the river, try and be out of the office and on the river by noon. The majority of people head to the office between 12-1 and everyone has to fill out a waiver and pay. It can get quite chaotic. Leave your shoes at home – Your flip flops will never make it out alive so don’t bother bringing them along. Leave them at the tubing office or your hotel. Keep an eye on the time – If you want your 60,000 kip deposit back, get back by 6:00 pm. If you don’t then they only return a portion of the deposit. Tubing in the dark is not only dangerous but it also starts to get cold. Don’t dive into the water – Don’t assume that tubing is now 100% safe. There are loads of rocks in the river and you are taking a risk anytime you do. It is impossible to know what lies just beneath the surface. Our butts scraped along rocks more often than not. Wear Sunscreen –The sun is hot. Apply sunscreen before you leave so you don’t have to take it with you/turn into a beetroot. You would be surprised at how many beetroots were out and about! If you can swim, be friendly, get involved in the games, have fun & drink responsibly, there is no way you cannot have a good day. 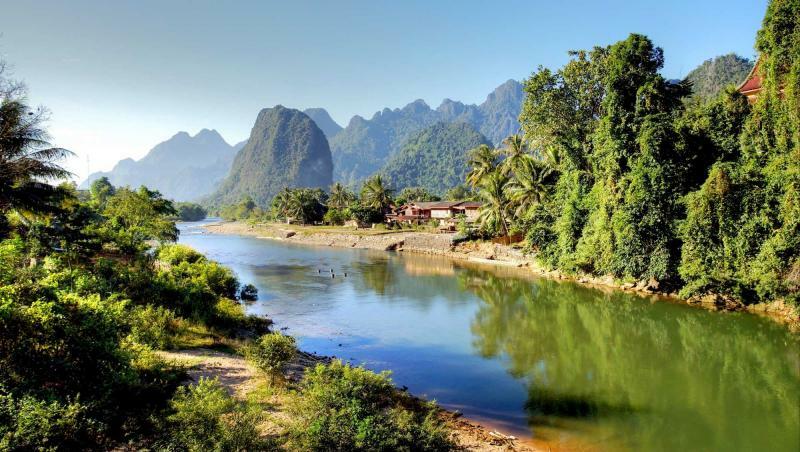 If tubing isn’t your thing then Vang Vieng has plenty of other things to do, plus a tonne of delicious restaurants to eat at. Hot air balloon for sunrise or sunset. Water Cave or Elephant Caves. Eat countless baguettes & drink endless fruit shakes. Party at Sakura– 8-9 free drinks, 9-10 happy hour. Buy 2 vodkas & get a free tank top. Quite the promotional bar here! Head to the Jungle Party on Friday nights. Eat at Amigos, The Noodle Shop, Bamboo Tree Cafe, The Aussie Bar & Gary’s Irish Bar plus of course the roadside crepe and pancake stalls. Please get the chicken parmigiana at the Aussie Bar. Just do it. Don’t ask questions. Go, quick. The streets are lined with tour offices so there’s no need to pre-arrange any of these activities. [Jacob]: Man oh man, was off-road buggy fun! When Em fell ill, I was out on my own for a day and I made the most of a boy’s adventure… solo riding on an ATV. 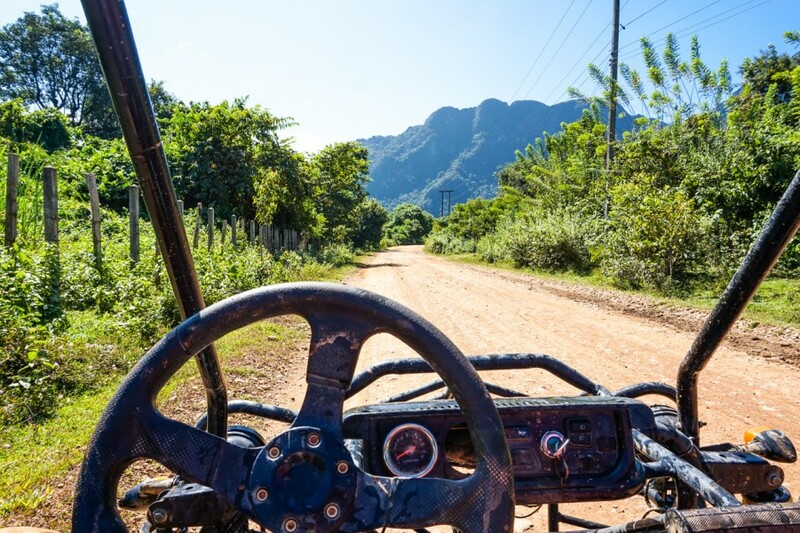 I rented the buggy (shown below) and ripped up the backstreets of Vang Vieng, flying through dirt puddles, rivers and dust-filled roads. It was one dirty adventure and to be honest, I’m glad Em wasn’t there, she would have hated it! 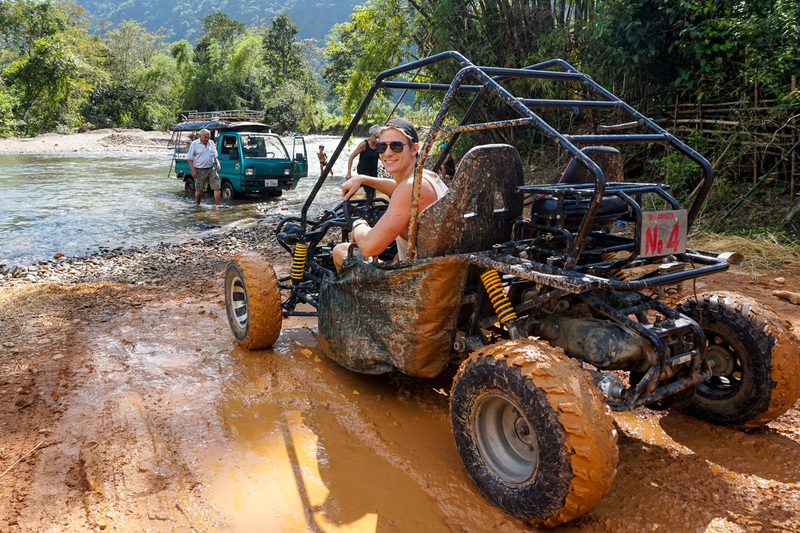 Tonnes of bumps, jolts and mud showers… I also managed to lose my thongs (flip-flops!). 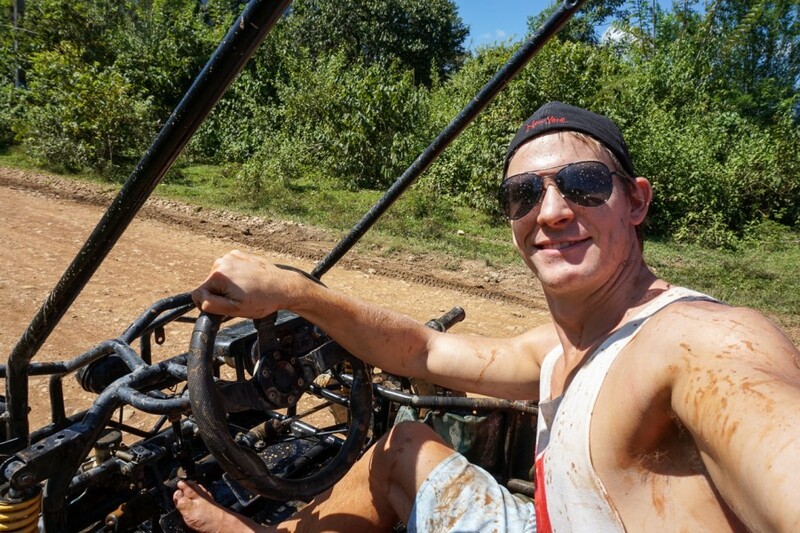 After an hour of driving my buggy like a maniac, it broke down. Thankfully, right at the entrance to the Blue Lagoon 3. With the help of some locals and the use of their phone, the company brought me a new one giving me an added hour free! More time to relax on the tubes and swing into the lagoon. If you get the chance, do this. You won’t regret it. Don’t wear your best clothes, mine were completely ruined… as you can see. Vang Vieng is small and you can walk almost anywhere you need to go in the town, therefore accommodation is fairly easy to find and quite convenient. It’s also very affordable. We stayed at Nice View Guesthouse and it was perfectly located with a great view, clean rooms and only $17 USD for a double room. 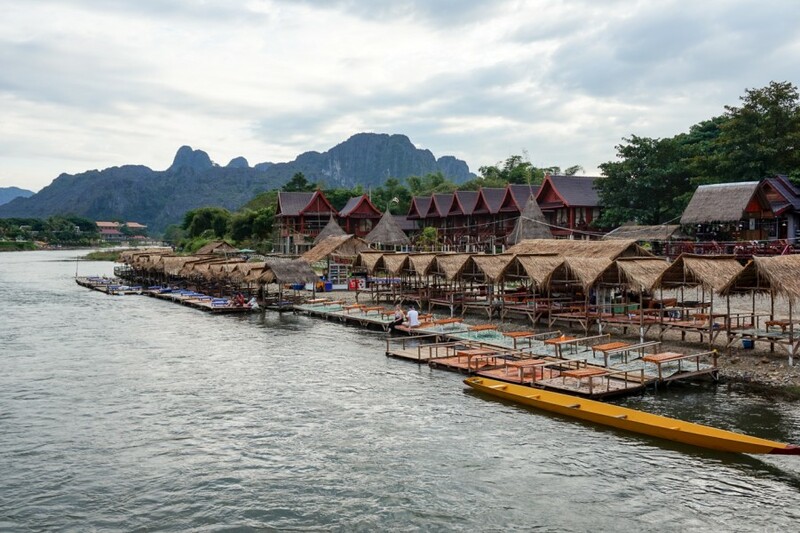 View Hotels in Vang Vieng. 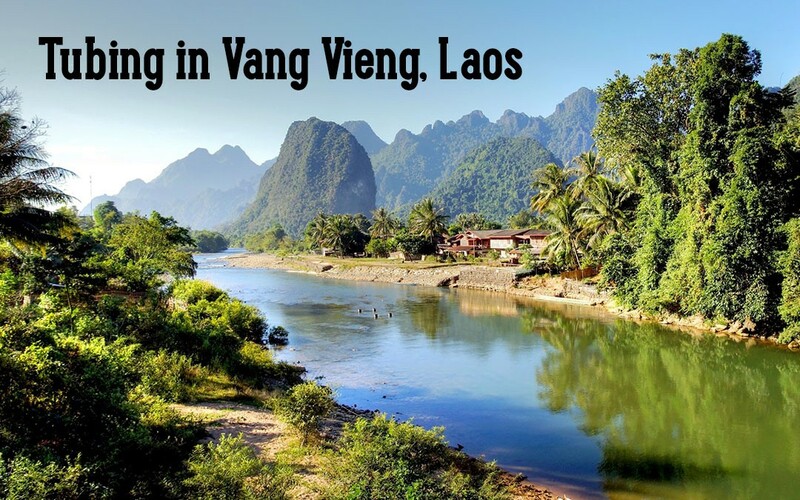 Vang Vieng was our last stop on our 2.5 weeks through Laos. 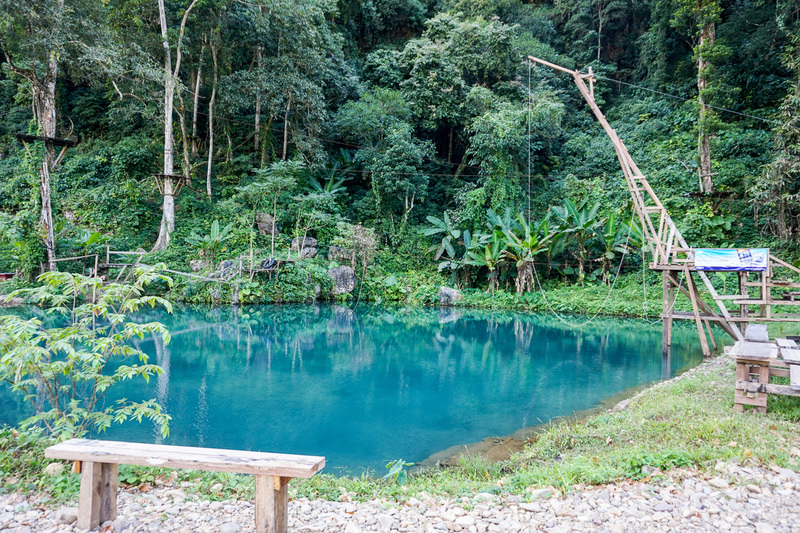 It had been way too long since the beach, so we couldn’t wait to get to our next stop… Thailand. 3.5 weeks in Thailand soaking up the sun whilst devouring all the curries, mangos, coconuts and seafood. Perfection! 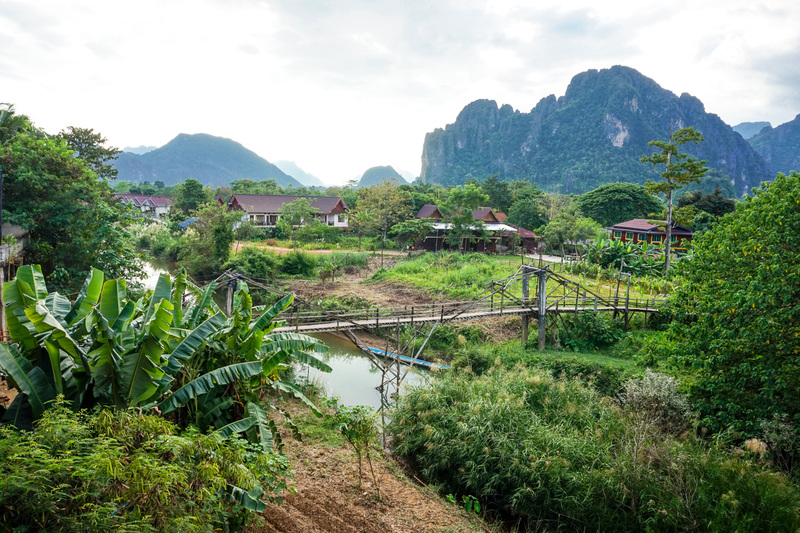 Be sure to visit Luang Prabang, our favourite place in Laos! 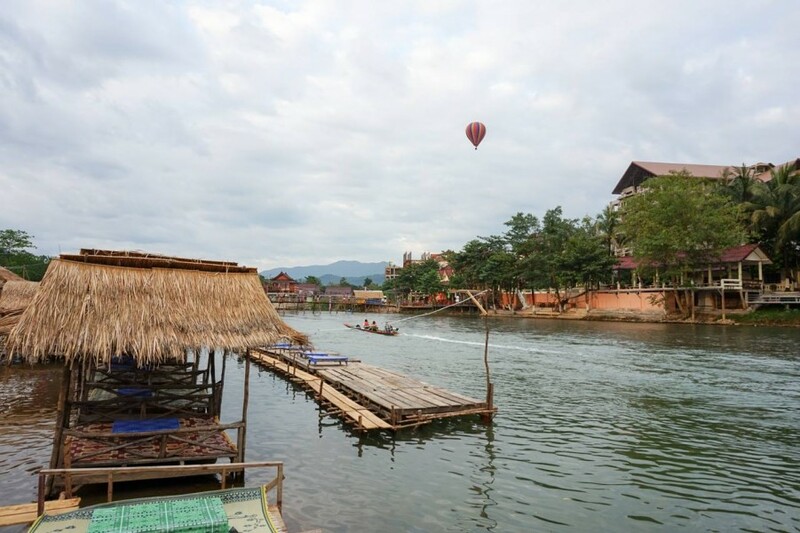 Book your transport here and find all you need to know about this incredible city in one of our posts – How to spend 5 days in Luang Prabang. Thanks again, and yeah it was a blast! Much pricier but so worth it! Amazing , Great to read. Happy New Year to you too Rupam! Hi! 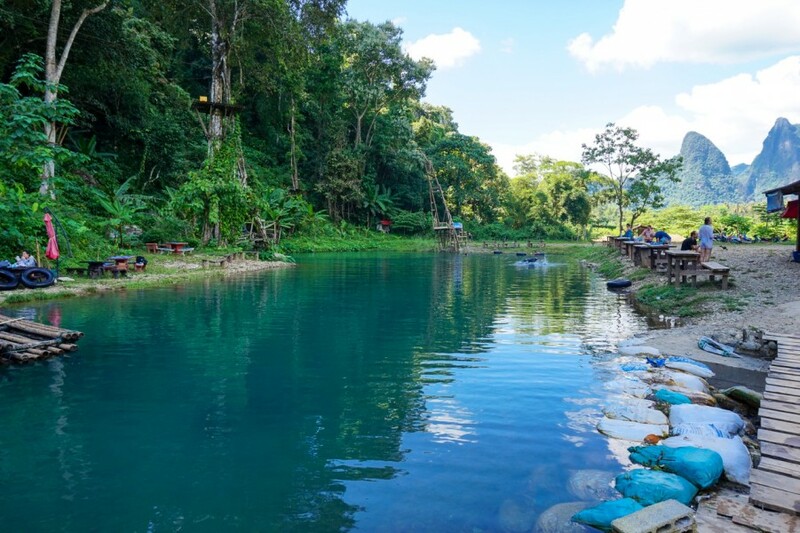 We’re going in Laos this coming June and we want to try tubing in Nam Song River. 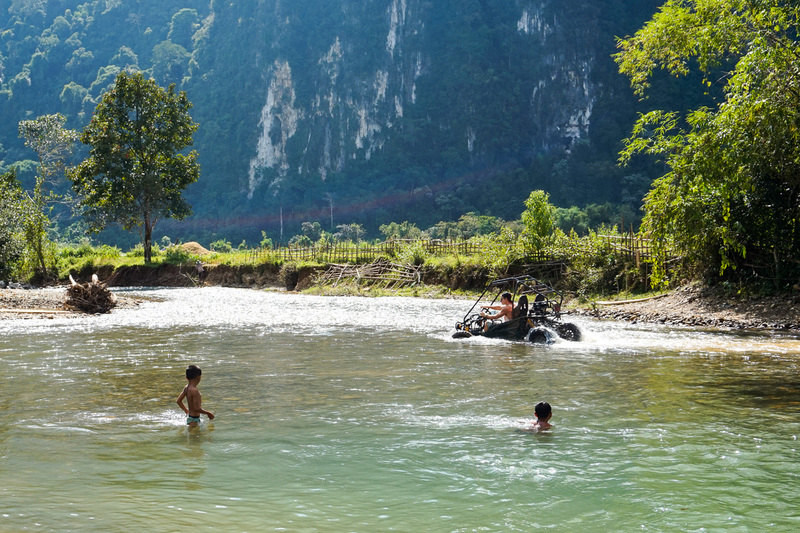 I just want to ask where did you go particularly to start tubing in Nam Song River? and also, are they only open only for Tour Agencies? 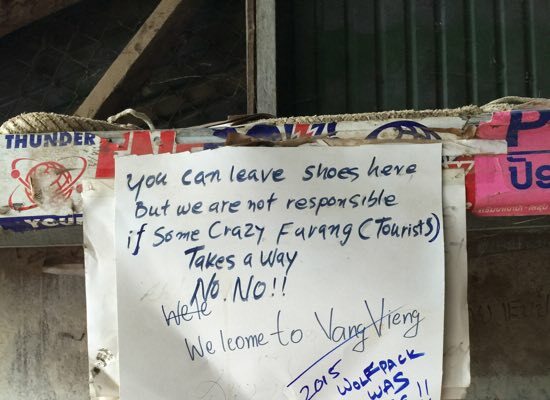 or DIY are allowed? cause we’ll be having a DIY Backpack trip in SEA this June. Thanks a lot! Hoping for you fast reponse.